The ovarian surface epithelium (OSE) is the part of the pelvic mesothelium that covers the ovary. It is also referred to in the literature as ovarian mesothelium (OM) (1, 2) or normal ovarian epithelium (NOE) (3), and it used to be called ‘germinal epithelium’ because it was mistakenly believed to give rise to germ cells. 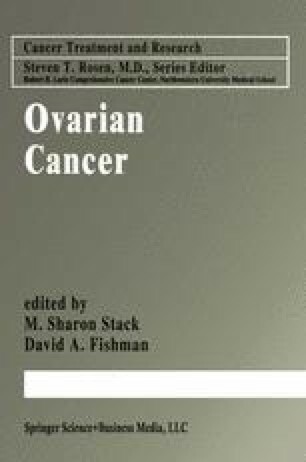 Because of its inconspicuous appearance and apparent lack of significant functions, the OSE remained among the least known components of the ovary until the last few decades, when increasing histopathologic and immunocytochemical evidence from clinical specimens suggested that the OSE might be the source of the most common and lethal of ovarian cancers, i.e. the epithelial ovarian carcinomas (1, 4–6). However, until relatively recently, there were no experimental systems for the study of the origin of these neoplasms. Animal models of epithelial ovarian cancer are not available because, except in aging hens (7), ovarian tumors in other animal species do not arise in OSE but in follicular, stromal or germ cells, and the biology of these tumors is fundamentally different from that of epithelial ovarian cancer. The establishment of culture systems posed problems because of the minute size and limited growth potential in vitro of OSE. In the 1980ties, the first tissue culture systems for OSE from different species (4, 8–13), including human (12, 13), were developed. Subsequently, information about the normal functions of OSE and its relationship to ovarian cancer expanded rapidly. The results of these studies showed that OSE is physiologically much more complex than would be predicted from its inconspicuous appearance, and they support the hypothesis that the ovarian epithelial cancers arise in this simple epithelium. Recently, the capacity of OSE to give rise to ovarian adenocarcinomas was demonstrated experimentally for the first time. This was achieved by introducing SV40 large T antigen and constitutively expressed E-cadherin into normal OSE in culture. The resulting phenotype closely resembled neoplastic OSE, and the cells formed adenocarcinomas in SCID mice (14, 15).